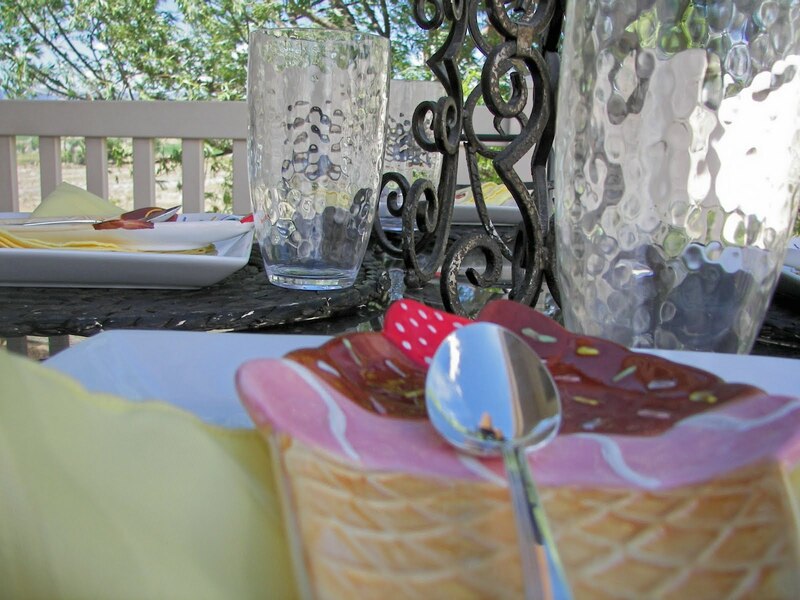 Red Couch Recipes: We All Scream for Ice Cream Tablescape! "I Scream You Scream We All Scream for Ice Cream!" 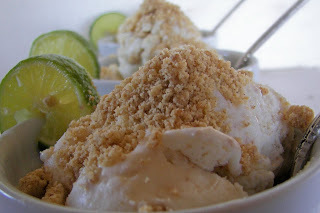 Welcome to Day Three of "Ice Cream Week" at Red Couch Recipes! Today we had a fun afternoon snack on the deck with my husband and my two daughters...my son is at a High Adventure Scout Camp. As were were eating ice cream, one of my daughters said that she "likes mom doing her blog!" 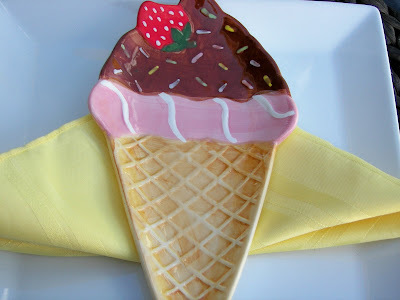 My nine year old daughter bought several of these ice cream plates for my birthday in May, and I bought a few more, and I have been saving them for "Ice Cream Week!" They come in two "flavors" and they are both delicious! She bought them at Robert's Arts and Crafts. We set the table on the deck. I don't know about you but I love eating ice cream with sterling silver spoons! The ice cream makes the spoons so cold!! 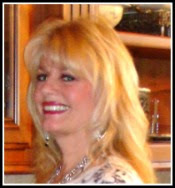 I received the "Damask Rose" pattern from my parents when my husband and I were married. I would love to find some spoons at a thrift store or tag sale just for ice cream! How about an Ice Cream Sundae? 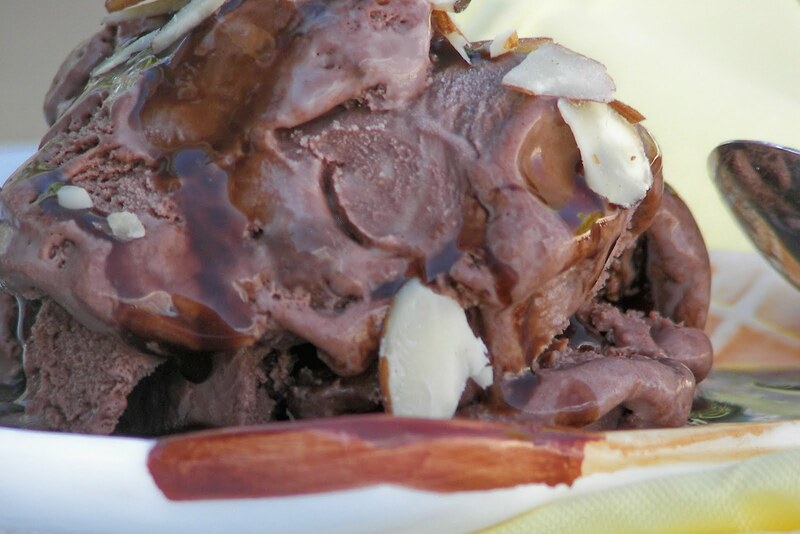 This is Rocky Road topped with Whopper's Chocolate Malt Sauce and Slivered Almonds. Hurry Up! Come and eat the ice cream is melting! Here's a close-up of the yummy ice cream! Thanks for stopping by Ice Cream Week at Red Couch Recipes. You might want to check out the following posts for "Ice Cream Week!" Click HERE for Key Lime Pie Ice Cream. Click HERE for Chocolate Malt Ice Cream. 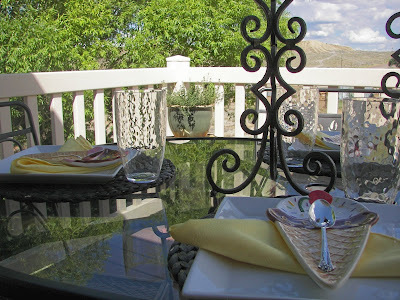 I am posting this with Susan at Between Naps at the Porch where you will be inspired to set a better table! You two have really been having fun with ice cream week and that means... I'm lovin' it too! Thanks! Joni, I am enjoying your ice cream week posts. Love the ice cream plates and your recipes sound great! Looking forward to your ice cream maker review! move over, hate to see good ice cream melt! you are killing me here...i am ready to dive right through my computer screen...yum! Joni, those ice cream cone dishes are adorable! Looking at that ice cream is making me wish I had made some this weekend! Oh, I am so ready for ice cream again and again and again. Yours looks so inviting. Cute little ice cream plates. Like the sterling spoon idea. Yum, yum, yum!! Those plates are adorable, and everything tastes better with a sterling silver spoon! Have you tried ebay? You never know what you can find in a pattern. I even find pieces for my pattern, and it's from 1893. I love the "Damask Rose" pattern too. Thanks for stopping by too!! Your photos darn near killed me! 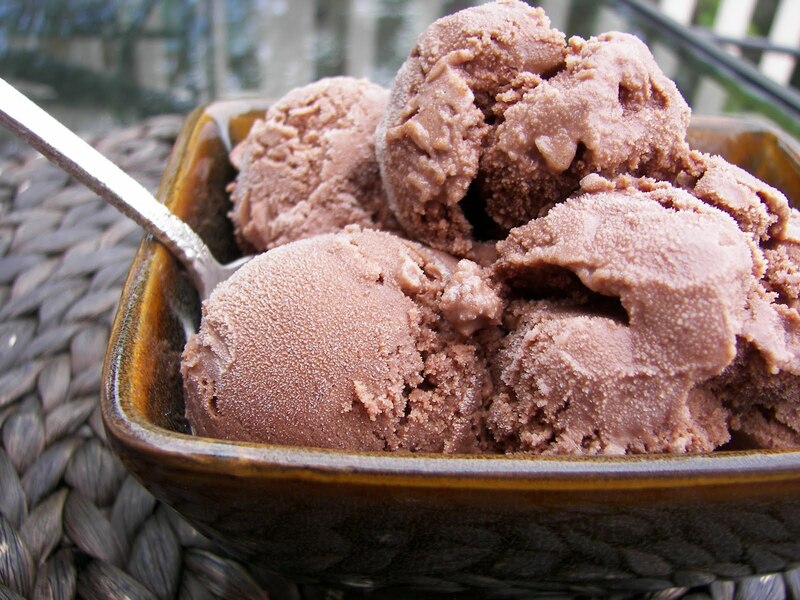 I LOVE eating soft ice cream...the more chocolate the better! I scream.. You screamed.. we both screamed for ice cream:-) Your post had the yummy ice cream & fun dishes though! Those plates are so cute! I love ice cream! I just KNOW that reading this post before going to bed means that I will actually gain weight in my sleep! I love ice cream! YOur tablescape is darling! 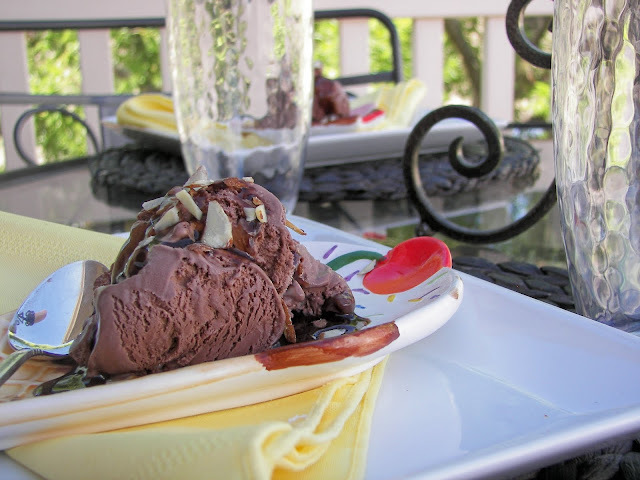 DO you ever make home meade ice cream? When I was little we had the hand crank kind, mu job was sitting on top of the crank so it wouldn't "jump" around. I just love that your daughter bought you the ice cream plates for your birthday! Ice cream is one thing I just cannot resist, and your photography makes me crave some at 8:23 in the morning! Such a fun table! What cute plates! I am sitting here, not having eaten anything yet and thinking that ice cream for breakfast may be a really good idea! I had forgotten how good ice cream is with a silver spoon. Thanks for the reminder. OMGosh, this all looks so good. I just came in from mowing and trimming and I am hot as a human hot dog..and so this ice cream ...is making me lick my computer screen. Don't forget to hook up with the ICE CREAM SOCIAL on Sat. This post is perfect !! 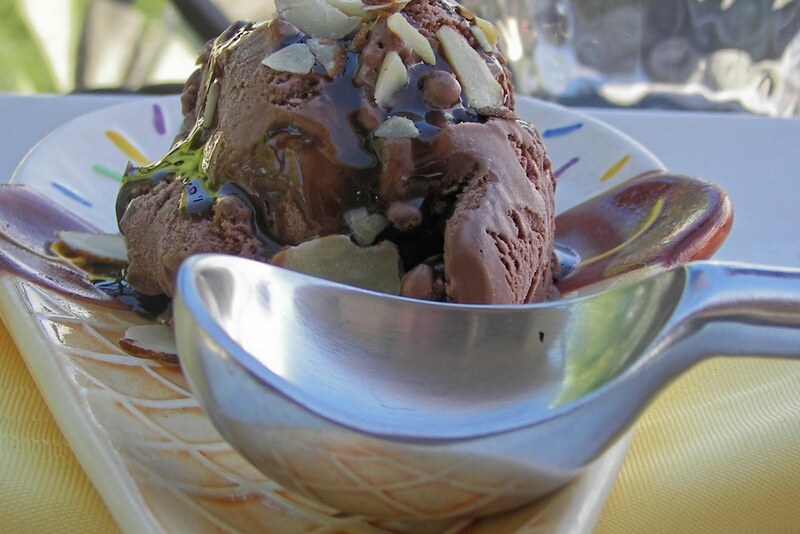 Love the dishes and since it is so very hot today, ice cream would be perfect right now! Hi. Welcome. 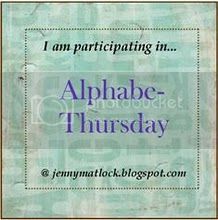 I am here from Brenda's blog Cozy Little House. 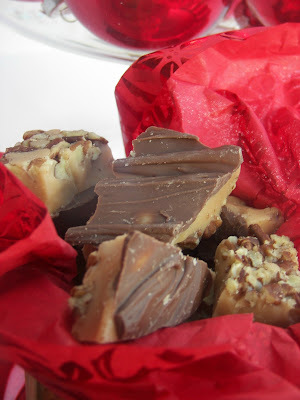 Your sister's blog and yours has some very yummy looking food. I'm going to have to try some of these. These ice creams look like something 7 and 9 year old girls would like, both to eat and make. We'll get right on it!